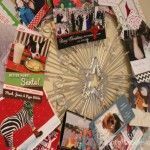 DISCLOSURE: I am part of the Deco Art Blogger Program and was provided product samples. I only promote and share products I personally use and recommend! To learn more, please review my disclosure policy here. 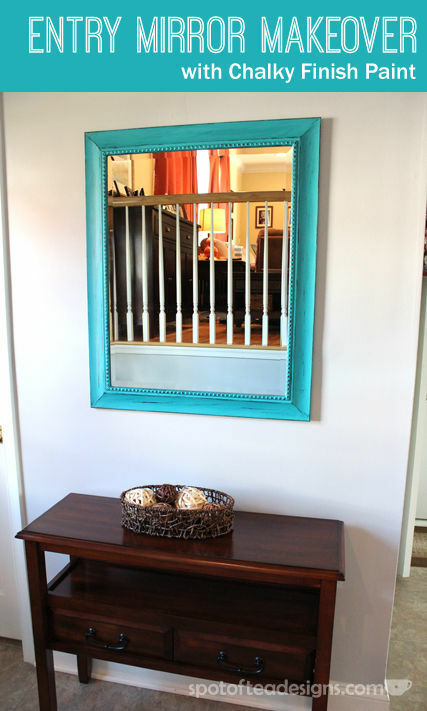 Like many homes, when you walk in the front door we have a vacant wall, perfect for the good old entry table and mirror combo. 4.5 years ago when we moved in, we purchased a table from Pier 1 that fit perfectly in this space and a mirror with a beaded detail edge to hang above. 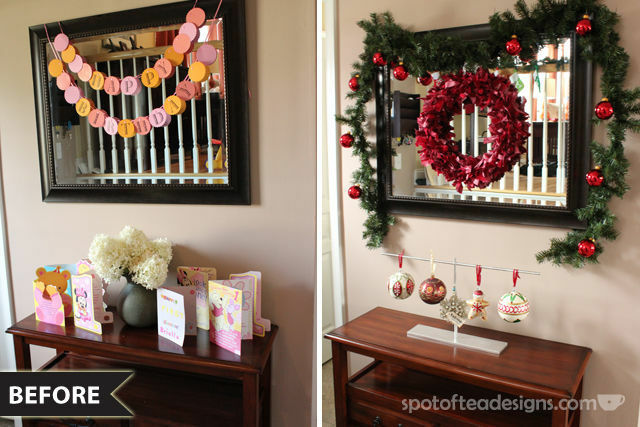 I LOVE to decorate this space for each season, like the birthday setup from Brielle’s Pinwheel first birthday party or when hanging the Fabric Scrap Wreath I made for Christmas. 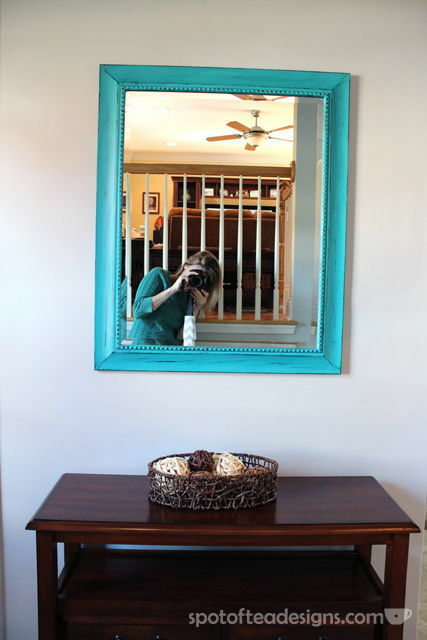 But when we recently redid our home office and foyer (upcoming blog post alert), I had a chance to reevaluate this area to which I realized… this dark mirror is just too big for this space! Sure a cute round one with fun details would probably be perfect here but I wasn’t into shelling out more $$ when I could work some magic to redo the one I already had. 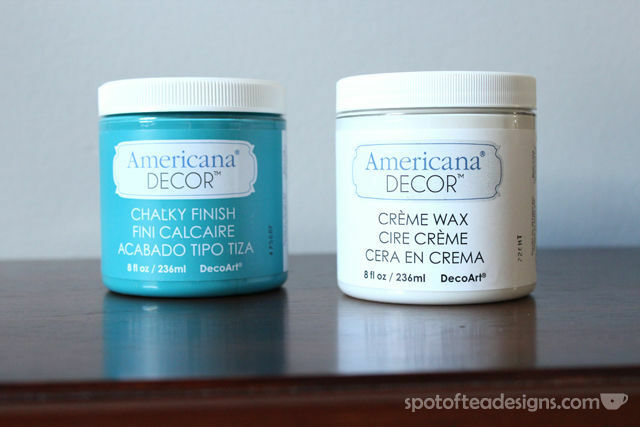 Enter: DecoArt Americana Décor Paint in Chalky Finish. 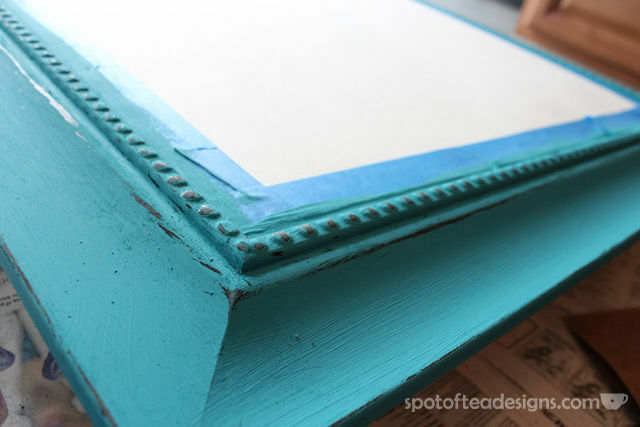 Chalk paint is something I’ve seen on a lot of blogs lately and am always drawn to the look. 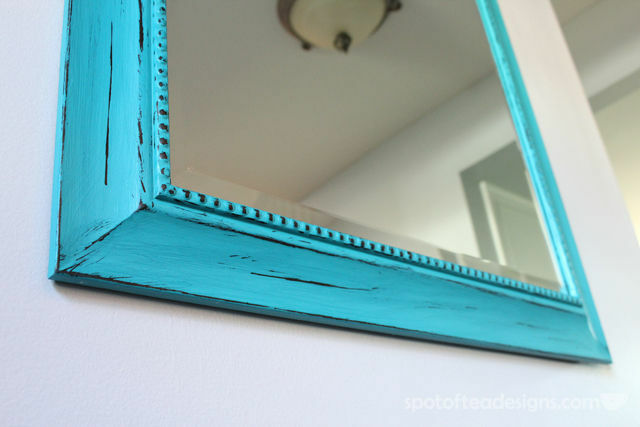 It’s important to note that it’s NOT chalkboard paint but rather a thicker paint that doesn’t require any priming. 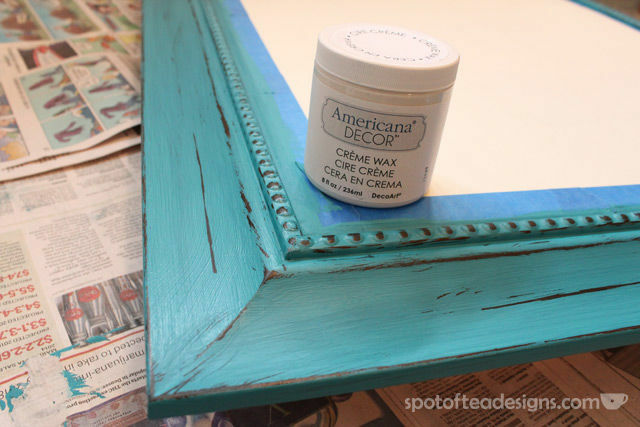 I chose a soft turquoise color called Treasure as a pop of color on my wall and a clear wax to seal it once complete. 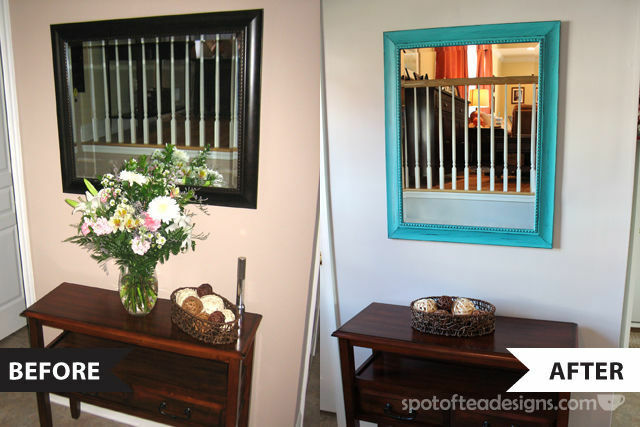 To complete this DIY transformation, I first covered my mirror with some scrap paper and painter’s tape and used a rag to clean off any dirt from the mirror. 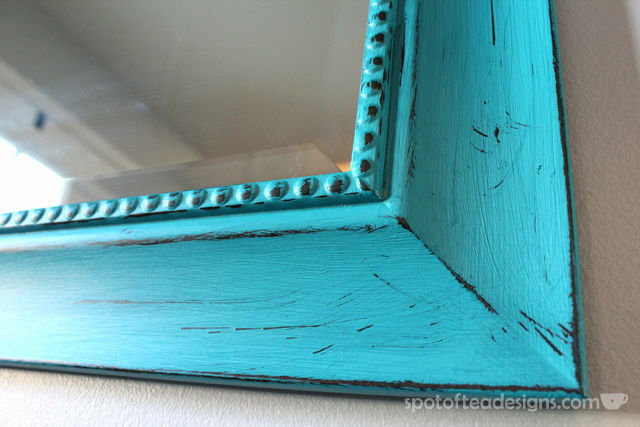 After applying one coat of paint to the whole frame I went back for a second for a thicker application. It’s not required but I felt like I needed it for my particular piece. After drying overnight (not needed, but it was how my timeline worked) I took a good look at the mirror and took the plunge to go shabby chic. 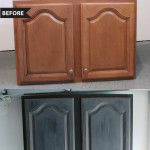 By rubbing a fine piece of sandpaper along all the edges, corners and a tiny bit around the beaded accents, the original dark color came through for a unique distressed look. Make sure you thoroughly clean all the little material that came off from sanding, including in all those nooks and crannies before the next step. Apply the clear wax and after drying, grab a clean rag and start buffing the frame to your desired shine. Not sure if you can tell on the above photo but the left side was buffed and a glossy sheen came through while the ride side was still very matte. 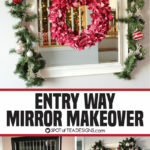 My mirror was done! I love the pop of color this now gives with our new grey walls! I do see lots of texture from both my paintbrushed application and sandpaper distressing and I love it! I totally look at all the home décor pieces at home goods in a new light now. I can do that look myself! I can’t wait to decorate this space for holidays and each growing season! (Including coming up with a better non seasonal staging than this wicker basket of balls!) Learn more about Deco Art via their website | Facebook | Twitter | Pinterest | Instagram | Youtube. Oh I LOVE this! 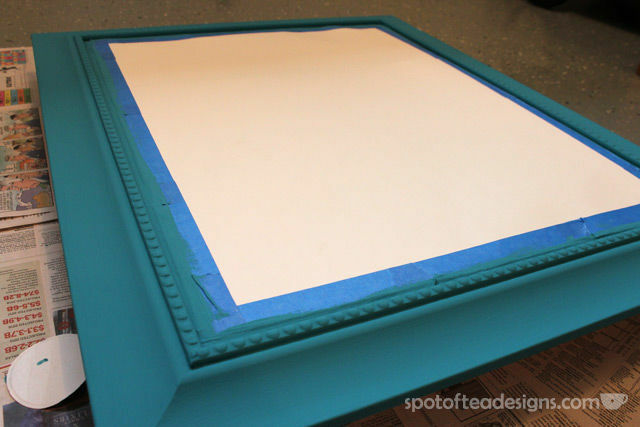 I have a mirror that I have been wanting to paint over but wasn’t sure what to use…until now! Amazing job. It looks beautiful!!! This is so cute! I love the new color! Thanks for sharing!